The occasion was graced by Shri Bandaru Dattatreya, Hon’ble Minister of Labour & Employment (l/c) as the Chief Guest. Shri P. Mahender Reddy, Hon’ble Transport Minister, Telangana, Shri Tummala Nageshwar Rao, Hon’ble Minister for Roads & Buildings, Women and Child Development, Telangana and Mr Ryoichi Shinke, Executive Officer and Regional Executive for India, MUFG. attended the event as the Guests of Honour. The dignitaries present at the event were appreciative of MUFG for its generous contribution and support towards the initiative. They encouraged Akshaya Patra to further its programme, which is a great initiative to bring children back to school and make a difference in their lives. The event was held in the presence of Shri Madhu Pandit Dasa, Chairman, The Akshaya Patra Foundation and was presided by Shri Satya Gaura Chandra Dasa, President, Akshaya Patra- Telangana and Andhra Pradesh. Mitsubishi UFJ Financial Group, Inc. (MUFG) is one of the world’s leading financial groups, with total assets of approximately US$2.6 trillion as of 31 March 2017. Headquartered in Tokyo and with approximately 350 years of history, MUFG is a global network with over 2,000 offices across 50 countries. The Group has about 150,000 employees and close to 300 entities, offering services including commercial banking, trust banking, securities, credit cards, consumer finance, asset management, and leasing. The Bank of Tokyo-Mitsubishi UFJ, Ltd. is Japan’s premier bank, with a global network spanning more than 50 countries. Outside of Japan, the bank offers an extensive scope of commercial and investment banking products and services to businesses, governments and individuals worldwide. In the Asia and Oceania region, Bank of Tokyo-Mitsubishi UFJ has presence in 15 key markets with Singapore serving as the regional headquarters for South Asia, South-east Asia and the Oceania region since July 2013, while the regional headquarters for East Asia including China is located in Japan. In addition, Bank of Ayudhya PCL (Krungsri), Bank of Tokyo-Mitsubishi UFJ’s majority-owned banking subsidiary in Thailand, with more than 700 branches and close to 15,000 staff, has further expanded the bank’s footprint in this region. In India, MUFG has a presence dating over 60 years and is currently a leader in the local loan markets. It has five branches in Mumbai, New Delhi, Chennai (including Sri Lanka’s representative office), Bangalore and Neemrana and partners large Indian, Japanese and multi-national corporates and financial institutions as they expand their businesses in India and across the world. The regional executive’s office is located in Mumbai and oversees all of the bank’s operations in India. Since 2000, the organisation has worked towards reaching more children with wholesome food on every single school day. Akshaya Patra Foundation is continuously leveraging technology to cater to millions of children. Its state-of-the-art kitchens have become a subject of study and they attract curious visitors from around the world. In partnership with the Government of India and various State Governments and inestimable support from many philanthropic donors and well-wishers; Akshaya Patra has grown from humble beginnings serving just 1,500 school children across 5 schools. 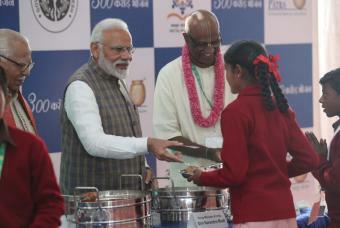 Today, Akshaya Patra Foundation is the world’s largest (not-for-profit run) mid-day meal programme serving wholesome food to over 1.66 million children from 11,548 schools across 12 states in India. Akshaya Patra reaches out to 95,585 children in 880 schools and 27,000 Anganwadi beneficiaries in Telangana. Hoechst House, 15th Floor, 193, Vinay K.